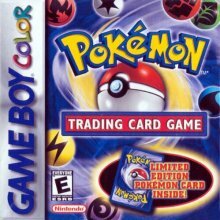 The Pokémon Trading Card Game is a spin-off title based upon the Trading Card Game that exists of Pokémon. In this game, you play as a new trainer who is on a journey to inherit the Legendary cards. To do so, the player has to defeat all 8 Club Masters and the 4 Grand Masters, in a system mirroring that of the main series Pokémon games, in card battles. This is done using the same mechanics as the standard TCG. This game features all of the cards from the original Base, Jungle and Fossil expansions, as well as multiple unique cards to the game, and many promotional cards. All of these cards are collected in-game by defeating the various characters in the eight respective clubs. These clubs are dotted around the island, and are navigated via the game's map. The game also features 50 pre-created decks for you to access when you have the cards required. There are several other modes to participate within in this game, including a multiplayer mode, where you can battle your friends, a mode allowing you to send & receive cards from friends, as well as in-game modes like Challenge Cup and the Challenge Machine.